WASHINGTON, D.C. -- The U.S. Payroll to Population employment rate (P2P), as measured by Gallup, rose slightly to 43.8% in October, from 43.5% in September. P2P in 2013 continues to lag behind 2012; P2P last month is down almost two percentage points from the 45.7% found in October 2012. Because of seasonal fluctuations, year-over-year comparisons are often helpful in evaluating whether monthly changes are attributable to seasonal hiring patterns or true growth (or deterioration) in the percentage of people working full time for an employer. While the P2P rate for October 2013 is down from the same month last year, P2P was higher in October 2012 than in any other month since Gallup began tracking the metric in January 2010. P2P in 2012 trended higher than in 2010-2011, especially in the last few months before Election Day, but fell sharply beginning in November. Average monthly P2P this year (43.9%) is now higher than it was in 2010 (43.5%) and 2011 (43.6%), but below the 2012 average of 44.4%. Gallup's P2P metric estimates the percentage of the U.S. adult population aged 18 and older who are employed full time by an employer for at least 30 hours per week. P2P is not seasonally adjusted. These results are based on Gallup Daily tracking interviews with approximately 30,000 Americans, conducted Oct. 1-30 by landline and cellphone. Gallup does not count adults who are self-employed, working part time, unemployed, or out of the workforce as payroll-employed in the P2P metric. Full-time self-employment is at 5.2% in October, statistically unchanged from 5.3% in September but up from 4.8% in October 2012. Although self-employment has increased over last year, the uptick doesn't explain all of the nearly two-point decline in the P2P rate. Unlike Gallup's P2P rate, which is a percentage of the total population, traditional employment metrics, such as the unemployment rates Gallup and the U.S. Bureau of Labor Statistics report, are based on the percentage of the workforce. 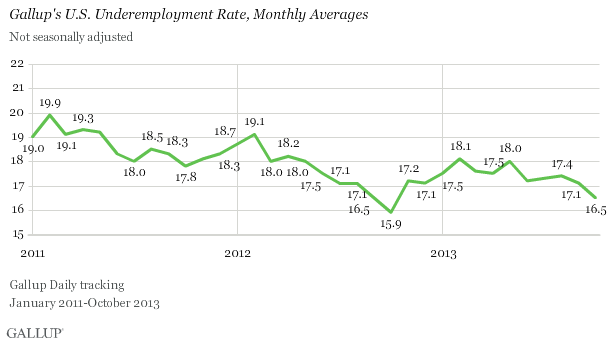 Gallup defines the "workforce" as adults who are working or actively looking for work and available for employment. The U.S. workforce participation rate in October was 67.1%, statistically unchanged from September's 67.0%, but down from 68.3% in October 2012. Gallup's unadjusted unemployment rate for the U.S. workforce declined to 7.3% in October, from 7.7% in September, continuing a three-year trend of broad decline after a brief spike in August. Similar to P2P, unemployment fluctuates seasonally, and year-over-year change is often the most informative comparison. However, October 2012 saw a dip in the unemployment rate that was quickly followed by an almost equivalent rise the next month. Consequently, though the 7.8% average monthly unemployment rate for 2013 so far remains below the average for 2012 (8.1%), last month's unadjusted unemployment rate is up slightly from 7.0% in October 2012. 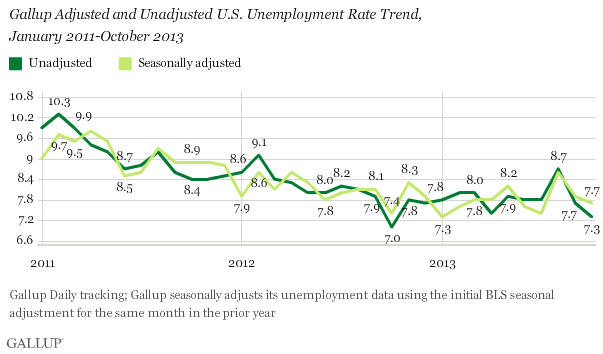 Gallup's seasonally adjusted U.S. unemployment rate for October is 7.7%, down slightly from 7.9% in September. Gallup calculates this rate by applying the adjustment factor the government used for the same month in the previous year. Last year, the government adjusted October's rate upward by 0.4 points. Underemployment, as measured without seasonal adjustment, was 16.5% in October, down from 17.1% in September, but up compared with 15.9% in October 2012, which was the most positive reading in Gallup's trend. 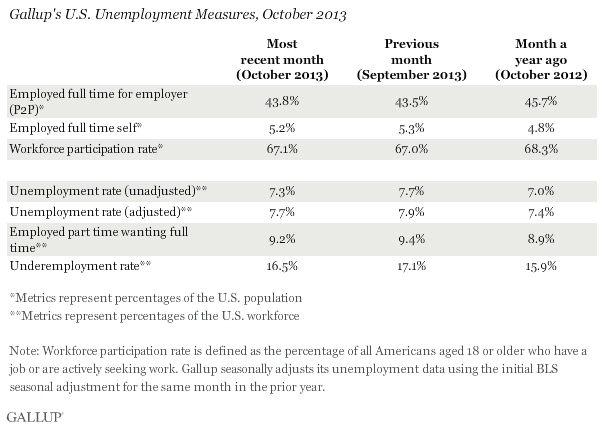 Gallup's U.S. underemployment rate combines the percentage of adults in the workforce who are unemployed with the percentage of those who are working part time but looking for full-time work. 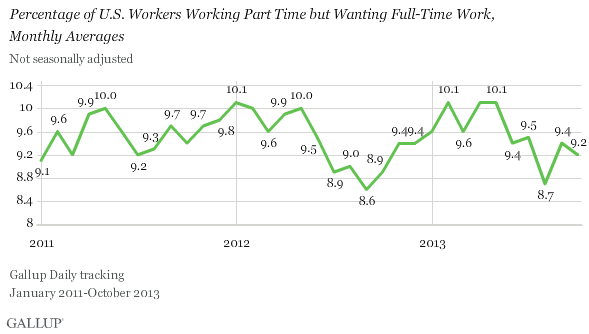 The percentage of part-time workers wanting full-time work was 9.2% in October, down slightly from 9.4% in September. Despite steady growth, the U.S. jobs market continues to show no signs of catching up to the pre-recession trajectory outlined in official 2007-2008 BLS data. While Gallup's P2P rate -- the percentage of all adults in the U.S. population who are employed full time for an employer -- is still slightly higher this year than three years ago, the net rise over that time has been almost imperceptible. P2P in 2013 so far has averaged 43.9%, a net 0.4-point increase from three years ago. Over that period, the percentage of the population that is self-employed has risen to an average of 5.3% so far in 2013 from 4.8% in 2010, a 0.5-point rise. The percentage of the population that is working part time but wants full-time work has likewise risen to an average of 9.6% so far in 2013, from 9.2% in 2010, a 0.4-point increase. This suggests that over the past three years, business hiring has continued to lag behind the demand for jobs, pushing many to risk striking out on their own or taking part-time work to make ends meet. Gallup's seasonally adjusted U.S. unemployment rate -- the closest comparison it has to the official numbers released by the BLS -- continued its slow decline in October, in line with the basic trend measured over the last three years. Gallup data suggest that when BLS releases its October employment report on Friday, it will likely report no more than a 0.1-point decrease in the unemployment rate. However, it is important to note that Gallup's adjusted number is based on past BLS seasonal adjustments, and those adjustments may not be the same this year. Additionally, while both Gallup and BLS data are based on robust surveys, the two have important methodological differences. Thus, although Gallup's employment numbers are highly correlated with BLS rates, Gallup's numbers tend to have more month-to-month variability, and the unemployment rate as reported by the BLS each month does not always track precisely with the Gallup estimate. Results for this Gallup poll are based on telephone interviews conducted Oct. 1-30, 2013, on the Gallup Daily tracking survey, with a random sample of 30,757 adults, aged 18 and older, living in all 50 U.S. states and the District of Columbia. Gallup's Job Creation Index dipped slightly to +19 in October, the first time since April that the index has dropped below +21. 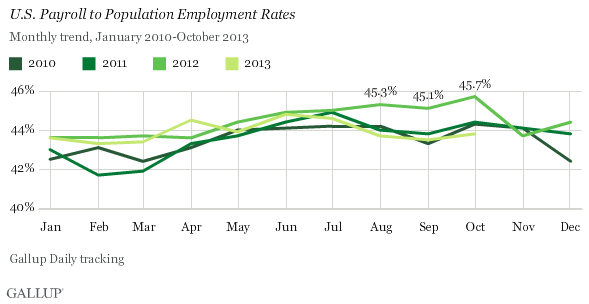 While still positive overall, the drop is linked exclusively to government workers' reports of less hiring.